... You just don't feel as enthusiastic as you used to, or one of your counterparts comments that your post-call notes have become haphazard. Maybe you find yourself missing opportunities during your sales presentations. It may be difficult to pinpoint exactly when it happened, but after a while you can no longer ignore the thought that tugs at you: "I've lost my edge." Don't panic! Almost everyone in a competitive career has felt that way at some point. Although it's a universal experience, we are somehow caught off-guard when it happens to us. As someone who has survived to sell another day, I've written a time-tested plan of action to jump-start your motivation and performance. We all know that the first step toward overcoming any challenge is acknowledging it, but admitting to a slump can be especially difficult in a results-driven industry like pharmaceutical sales. Well, a lot of what we do every day is difficult, but we do it anyway. Why? Because we define ourselves, in part, by our achievements; we are doers by nature. With a positive approach, you can turn a personal stall into another opportunity for accomplishment. Recognize it as a real but temporary obstacle to your ambition, and you've already begun to remove it. Personal responsibility is a hallmark of success. We each decide every minute of every day how to spend our time, and those decisions shape both our thinking and our behaviors. Simply taking ownership of how you feel and what you do can be a lift. Accepting responsibility encourages us to be proactive in creating solutions rather than cultivating excuses. Inherent in solutions are new ideas and opportunities to implement them, which give us renewed motivation and direction – just what we need! Refocusing on our goals brings meaning to our process and reminds us that our daily activities are parts of a larger whole. When you present the latest clinical findings, you enhance a prescriber's ability to treat patients safely and effectively. You're not just trading samples for signatures; you're promoting quality of life! If this reminder alone isn't enough to get you fired up for your next day in the field, take a tip from the pros. The most successful sales reps I know use personalized visual aids to help spur their enthusiasm. Try posting pictures or motivational slogans in your car, your planner, your presentation binder — anywhere that will catch your eye. Do you begin each call with a clear statement of purpose? Do you probe to uncover prescriber objections and needs? Do you gain some type of commitment on every call? Do you follow through with an action plan? As pharmaceutical reps, our constant challenge is to find the new in the familiar. Taking time to refocus is a great way to spark something innovative in your attitude and your skills. If your parents are anything like mine, they probably said you could grow up to be anything you wanted to be. If your life has been anything like mine, you have since realized that's not entirely true. For example, we have eight remote controls in our house and I don't know how to use any of them. I'm definitely not the person to call if you need help setting up your home theater system. I am, however, an accomplished musician, so let me know when you get that home theater set up and I'll stop by with an original CD. As we go through life, informal self-assessment instinctively guides our choice of a career, hobbies, a spouse, etc. Tapping into your self-awareness can also be a means to getting your motivation and performance back on track. You owe yourself an honest assessment, and this step challenges you to go beyond a basic inventory of your strengths and weaknesses. Carefully consider the requirements of your position and ask yourself: Which competencies do I most enjoy? What aspects of my job do I try to rush or avoid altogether? In what areas am I most effective? Least effective? Drawing on your real-world experiences, recall how you typically respond to different physician specialties. Which selling situations have you found most challenging? Most comfortable? How do you respond to different personality types? Remember, your goal is to identify any impediments to your success, so make your answers as specific as you can. The more candid you are, the more you will benefit from this investment of your time and the sooner you will be your dynamic self again. Conventional wisdom is that we never see ourselves as others see us; therefore, feedback is an essential complement to your self-assessment. The same way that you target your sales efforts based on your objectives, consider seeking feedback from the people most relevant to your professional development. Your direct supervisor or trainer is reasonably accessible and should be able to provide an objective assessment of your current competencies, as well as pertinent impressions of how your performance has changed over time. Territory counterparts are another important resource. Since your work habits directly impact their success, they have likely formed definite impressions of your work. Remember, specificity is key, and asking direct questions will garner the most useful feedback: What do you think is the most significant contribution I make to the team? What do you think are my strongest selling/territory management skills? What would you suggest to make my sales presentations stronger? The prescribers in our territories are often overlooked as sources of professional feedback. By skillfully asking questions, you can increase your self-awareness while improving your customer service: Which is the most helpful way for me to present information to you, citing a clinical trial or asking about your experience? Have your patients benefited from the lifestyle information I gave you? What is the most important thing I can do when I call on you? Step 6: Are You Having Fun Yet? This step truly is as straightforward as it seems. It's a reminder that life is larger than whatever fire you're putting out today, and if you don't enjoy what you're doing, why do it at all? It's time to check in with that dynamic duo, motivation and performance. Like a figure-eight, this process provides an end within the means, and chances are you've already regained at least some of your former synergy. My manager's favorite truism is "No one stays the same." As you continue to grow and evolve in your career, you may want to revisit this exercise from time to time. A fundamental change in your motivation or performance may signal your desire for increased responsibility or a different focus within your company. The insight you have gained here can be the cornerstone for your next professional adventure! Still stuck? Sometimes the key to moving forward is simply to keep moving. As published in the July 2003 issue of Pharmaceutical Representative magazine. 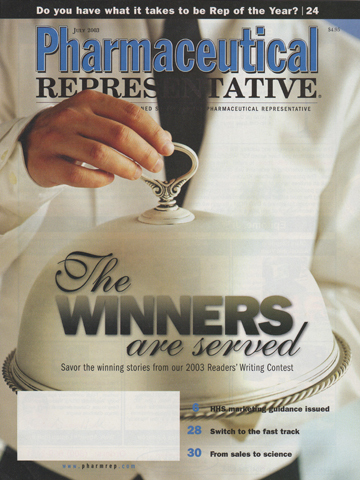 Copyright 2003 Pharmaceutical Representative magazine.